Purina One is hoping to engage cat lovers across the world with a Cat Camp event this weekend in New York City. The NestléPurina PetCare Co. brand last year engaged consumers with a Cat Café with the help of a “Dancing With the Stars” judge Carrie Ann Inaba. This year, cat lovers will be treated to camp-themed activities including include a traverse climbing wall, stretching tent, a purposeful play pond and a fun DIY puzzle feeder activity. Adoptable cats looking for homes will be featured from a local shelter. The Openhouse event space at 201 Mulberry in New York’s SoHo neighborhood will undergo a cat-approved transformation. It will be open to the public July 31 and Aug. 1 from 10 a.m. to 6 p.m.
During the pop-up event, Cat Camp counselors will guide members of the public through a series of activities that reflect a healthy cat’s routine. Purina One cat expert Deb Greco will talk about cat nutrition and other cat health issues. Those not in New York can watch live, streaming video of Cat Camp via Periscope on Purina One’s Twitter feed @PurinaONECat and join the conversation with #ONECatCamp. The event also will be featured on Purina One’s Facebook page. Remote participants can share questions with on Twitter by tagging @PurinaONECat and #ONECatCamp. 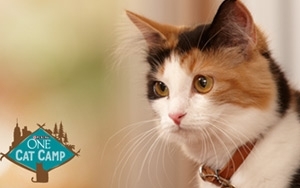 Through Cat Camp, Purina ONE hopes campers leave feeling empowered that they know how to help support their cats’ health and happiness every day and for a lifetime.